Each phase of project management has a distinct purpose, importance, and set of outputs designed to ensure that the project manager is moving the project towards the desired results. The first phase is Project Initiation. There are five phases of project management. Each phase of project management has a distinct purpose, importance, and set of outputs designed to ensure that the project manager is moving the project towards the desired results. The first phase is Project Initiation. The primary purpose of Project Initiation is to discover the project’s scope — where are its boundaries? As you see in Figure 1, you need to determine and document the User Requirements & Project Assumptions, produce a Business Case Justification & Feasibility Study, and put together a Project Charter and Project Team. Who or what groups are impacted today? What pains do they experience? What will the improvement look or feel like? How will the environment or daily work practices change? What are the desired project benefits and costs? Talk to management about their project assumptions — time frame, budget, resource availability, standards, regulations, and other data — because they impact the problem. Note: You are not solving the problem yet, but quantifying it. It is important to collect facts at this stage of project initiation. In this stage, “facts” include assumptions and perceptions, so get everything on paper and/or recordings. Use an audio or video recorder to collect quotes. You will use all of these facts to build your business case justification. You start your business case research with a feasibility study. Now that you know what users want, you need to find solutions, technologies, or methods that will help resolve their issues. Collect qualitative data from your process analysis, industry benchmarks, and through industry research. One of the most important details at this stage of project initiatioin is the Return on Investment (ROI). You’re asking management to make an investment — management expects to get some type of return on the investment. Usually you’re asked for the financial ROI but even if the return is intangible, you need to justify the expenditure. Start by determining your objectives, measures or cost variables and establish a baseline figure for comparison. Project baseline and expected results (as per objectives) should be for a reasonable interval (e.g., 12 months) after project completion. Be sure to explain how or when the sponsor/champion will experience the effect of the cost savings or other justification. Management may also want to know the risk exposure and how this investment compares with alternative capital uses, using Internal Rate of Return (IRR), Economic Value Added (EVA), or Net Present Value (NPV) calculation. Conclude with the total cost of ownership, or TCO, including intangible benefits that will be realized, too. You are now ready to build your business case justification using the data from your user requirements, project assumptions, and feasibility study. Your business case is designed to convert all the data into information that convinces management – or the customer – that your project will deliver positive results. It should answer who or what groups are impacted, what the benefits and risks are for the selected solution, and what it will cost in terms of time and money. Projects start with an idea, yet we don’t know what we don’t know. Projects require some learning and solutions will evolve. So, how do you focus a project team on your solution? You start with a project charter, used by the project manager to document and communicate a common understanding of the project with all stakeholders — management, customers, and the project team. The project charter focuses the project team on the main elements of the project in order to control the dreaded scope creep that often seems to invade projects. Small changes that, individually, may appear acceptable but collectively, add up to significant project expansion. Effectively manage the scope and you effectively manage resources and, ultimately, the project. Think of the project charter as a contract formed with the project stakeholders. I like to keep the project charter to a single page that can be posted on the wall as a constant reminder of what the project is all about (Figure 1). Some individuals may include project constraints, budget, risks, resources, assumptions, stakeholders, revision history, funding authority, oversight, project structure, roles & responsibilities, and even a glossary in their charters. Personally, I feel that once you add all of this you have a project plan, not a project charter. You definitely can’t keep something like this to one page if you add all of this. A charter is an overview: I say, save the details for the project plan. The project charter is an important step in the project initiation phase and the first step in a disciplined project management process. A project charter assists you in project governance, demonstrates you are following project management best practices, and it’s a great tool to get buy-in from everyone involved. Start project initiation with User Requirements & Project Assumptions, a Business Case Justification & Feasibility Study, and a Project Charter & Team Selection. 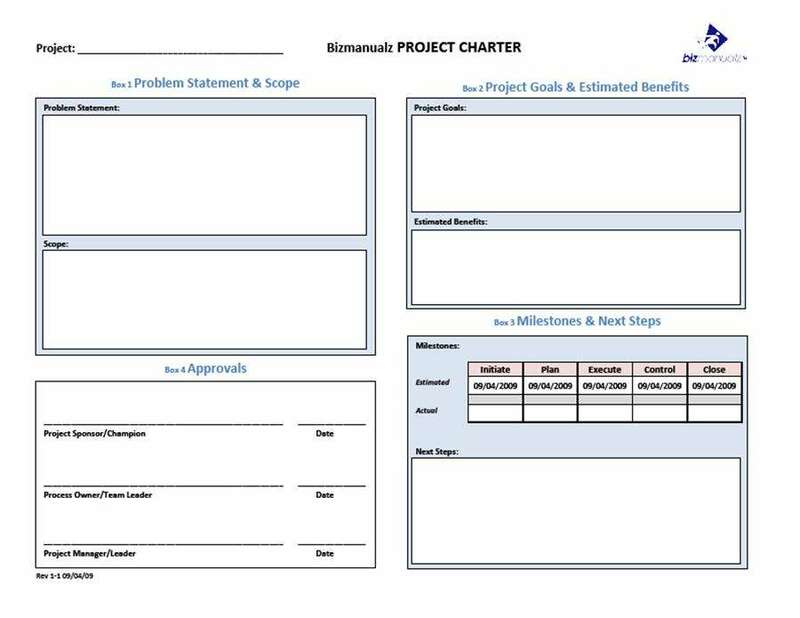 Use the project charter (Figure 1) to focus the project team on the key project elements. Close out the Project Initiation Phase with a phase review.